The Cast and Orchestra of THE BEST OF BROADWAY. 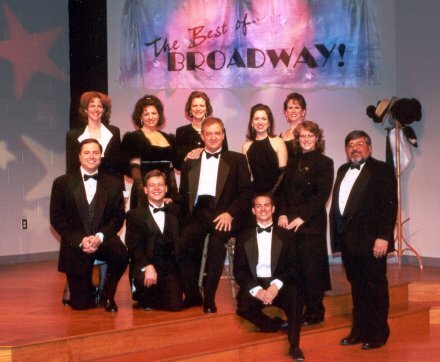 Gus Gordon, Mary Jo Curry, Greg Floyd, Becky Garretson, Doug Hahn, Barbara Burkhardt, Jeff and Karee Prince in THE BEST OF BROADWAY. In my time so far writing reviews, I've come up against a couple of shows that were, for one reason of another, thought of as "review proof." Meaning no matter what I - or anyone else, for that matter - had to say, the show would probably draw a full house and standing ovations every night. So far, those shows have been the ones with "peter" and "pan" in the title and the name Gus Gordon on the cast list. "Best of Broadway," presented by Gordon Productions, is another of those fortunate shows, not just because it may be almost immune to criticism, but also because it's well done. And good for me, as I'm sure I would have had to face an angry mob outside my house should I have felt compelled to write a disparaging word about this show or its producers. 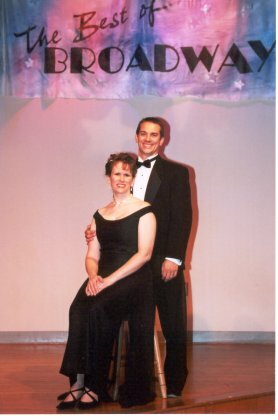 "Best of Broadway" is a collection of songs from popular Broadway musicals and sung by a group of four men and four women. There is little dialogue to lead you from one song to the next, and seldom does one number make a transition to the next. But everything is still pretty seamless. The performers sing, dance, flirt with the audience and have fun doing it. Gordon is a talented and popular performer, yes, but here he is only one of several very gifted artists who wowed a sell-out crowd Friday night at the New Salem Visitors Center Theater. 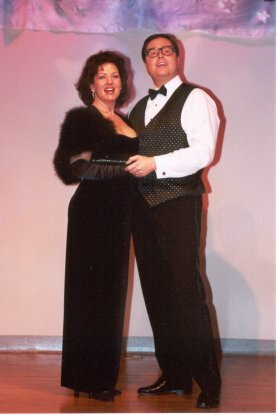 Fellow performers are Barb Burkhardt, Mary Jo Curry, Greg Floyd, Becky Garretson, Doug Hahn and Jeff and Karee Prince. 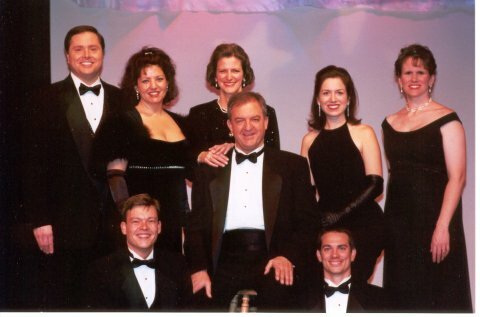 Debbie and Roger Holmes and Mary Myers comprise the orchestra. This group is refinement through and through - every gentleman in a tailored tux, each lady in a elegant gown. Simple choreography and minimal props add to the classiness of the performances and sophistication of the show. As well as looking smashing, everyone onstage was in very good voice Friday night. I don't recall a single note out of place. The songs chosen complemented each singer's abilities, and the harmonies on several numbers, particularly with the men, were pure enjoyment. The length of the show is worth mentioning. You might think it would be shorter since it's a musical revue, but it's not, although 10 to 15 minutes could have easily been dropped from each act by making some strategic cuts. Some songs could be considered a bit obscure, and too many mellow songs were lumped together. But it was nothing too distracting. Again, if I wanted to, I could say this show was show was about as much fun as cleaning the hair clog out of my bathroom drain, and it wouldn't matter. I'm thankful that wasn't the case. But above all else, I was informed before I left that "Best of Broadway" is already sold out. In case you would like to get on a waiting list for the two remaining performances, by all means call 632-4000. You might just get lucky. 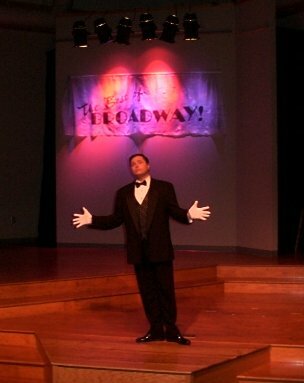 The Gordon Productions presentation of "The Best of Broadway," on Sunday night at New Salem was marvelous. Eight people onstage, spinning just one fabulous song after another, presented one of the most entertaining evenings any Broadway lover could want. The songs were great, but so were the singers! This show could have been a disaster, if even one voice or acting talent was weak, but they all were very, very good. With people such as Barbara Burkhardt, Mary Jo Curry, Becky Garretson, Jeff and Karee Prince, Greg Floyd, Doug Hahn and Gus Gordon, who could miss? I wish all my voice students could have been there to see just how to "sell" a song, and I wish that I could list my favorites, but there were too many! Their finale, "Try to Remember" (those days of September...)from "The Fantasticks", followed by everyone in the "Star Spangled Banner," had me almost in tears. It was a family affair with the accompaniment: Becky Garretson's sisters, Mary Myers and Debbie Holmes (with husband, Roger) made up the orchestra. It was beautifully done. This sold-out show should have run another weekend!